Saturday Night: Turning cloudy. Lows in the upper 40s. Sunday: Mostly cloudy. Showers. Cool. Highs in the upper 50s. Monday: Mostly cloudy. Showers. Cool. Highs in the mid 50s. After a foggy and cloudy start to the day, that fog has at least burned off, but a few clouds have stuck around - but not enough to keep from shining through. This afternoon will be absolutely beautiful under more sunshine than clouds with highs in the mid to upper 60s to pockets of 70 degrees. At the immediate coastline, due to water temperatures in the 40s will remain slightly cooler than farther inland. Even though it’s a stellar Saturday, we still have a Flood Watch posted for northern Maine due to high flowing rivers that are expected to crest over the course of this weekend. If you are in that region, just be aware of that on your travels. Tonight, a line of showers moves in from west to east, as early as 7 p.m. in western Mass, Southern Vermont but these will be scattered showers through the overnight. The showers fill in through Sunday morning as we have an upper level low over New England. This will spin the system over the region - allowing for on and off showers over the course of our Sunday. Aloft, we have a colder pocket of air that will allow for some of these showers to form hail or graupel at times. High temperatures on Sunday only stretch into the upper 50s for most. We start the week off on a cooler note with highs in the 50s under mostly cloudy skies and some spotty showers. Otherwise the rest of the week is looking more late spring to early summer! Yes, we are talking a warm-up to near 80 by Wednesday and Thursday - with a few thunderstorms possible Thursday. By next weekend, we’ll likely be back into the mid to upper 60s under partly sunny skies. 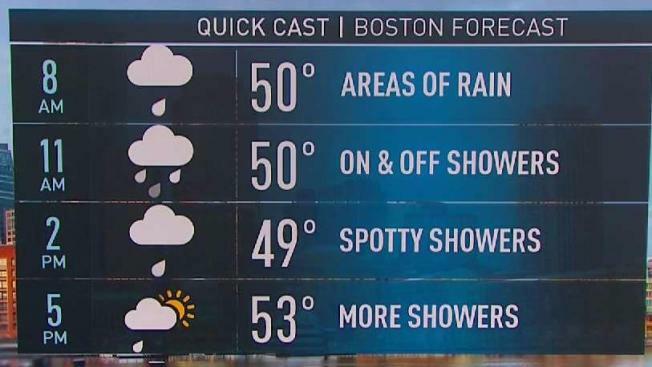 Don’t miss a single forecast or alert by downloading the NBC10 Boston / NECN app right to your phone.